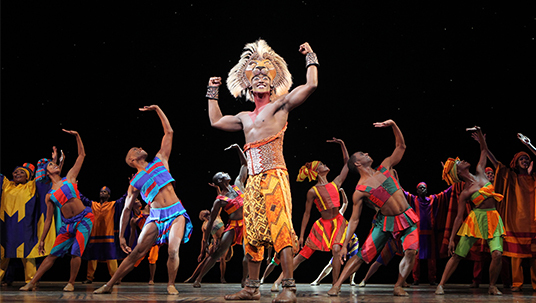 Lion King, The The stage version of the animated film had a pre-Broadway tryout at the Orpheum Theater in Minneapolis beginning July 8, 1997, before opening in previews at the New Amsterdam Theater on Broadway on October 10 (official opening was November 13). The show earned rave reviews and smashed box office records. Directed by Julie Taymor. The performers utilize a wide array of masks and puppetry techniques to portray the story’s 13 characters, as well as dozens of other animals. With a wholly original design, there was no attempt to re-create the animated look of the feature film. Eight songs were added to the five in the movie. The production was awarded six Tony awards–for Best Choreography (Garth Fagan), Best Costume Design (Julie Taymor), Best Lighting Design (Donald Holder), Best Scenic Design (Richard Hudson), Best Direction of a Musical (Julie Taymor), and Best Musical. The show closed at the New Amsterdam on June 4, 2006, and moved to the Minskoff Theater on June 13 to make room for Mary Poppins at the New Amsterdam. In April 2012 it became the highest grossing show on Broadway, passing Phantom of the Opera. In 2013 it hit $1 billion in grosses from North American touring companies. In 2014 it became the highest grossing of any production in any entertainment medium, with worldwide grosses of more than $6.2 billion. On June 16, 2016, a Mandarin-language version of the show premiered in the Walt Disney Grand Theatre in Disneytown at Shanghai Disney Resort.